Back in 2007, Jasper McGandy and Christian Kount (both now of Cult of Youth) formed a band called The Hunt and began to play a brand of post-punk, influenced — as their label Sacred Bones says — by The Southern Death Cult and New Model Army. The Hunt recorded a seven inch–Sacred Bones’ first ever release, and a driving factor in the formation of the label–toured, and in 2009 recorded a full length. That LP, titled The Hunt Begins, was never released. 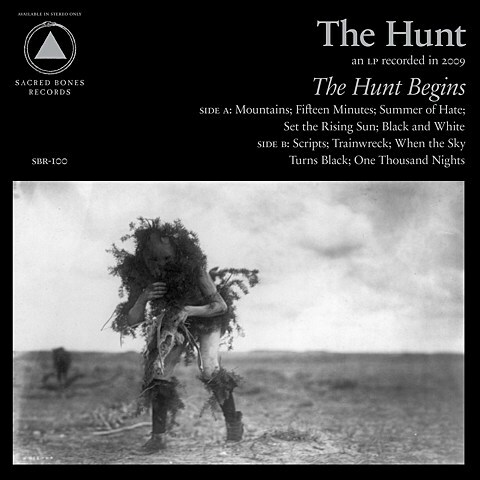 Now, to mark a milestone for Sacred Bones and to bring a deserving LP to the light of day, Sacred Bones is releasing The Hunt Begins as the label’s 100th release. The first song off of The Hunt Begins, “Fifteen Minutes,” is a seriously catchy goth-tinged post punk anthem that bodes well for the rest of the album. Listen to it below, and hum it for the rest of the day. Some of those early The Hunt shows were at Home Sweet Home, back in the early days of the weekly Wierd party. The Hunt will play a one-off, last hurrah show to celebrate the release of The Hunt Begins at the current iteration of the Wierd party, Nothing Changes, on November 20. In other Nothing Changes and Cult of Youth related news, Believer/Law, which features Cult of Youth’s Sean Ragon, were supposed to play Nothing changes tonight (10/30) with YOU., but they’ve dropped off the bill and Ell V Gore was added. On next week’s bill, Daisy Chain has replaced Hot Guts.